This design was made for a client for working in England, with his base in the United States and the family summer home in Marblehead, MA. The drawings posted here were finished in 2001. The term casual is actually somewhat tongue-in-cheek. This is a capable yacht with an owner’s cabin and 2 guest cabins, for a family of six, plus a crew of two. But calling her casual might in fact make some sense because this is not a yacht optimised for serious blue water cruising; nor is she the fastest kind of cruiser-racer. The idea behind the design is to create the most docile, sweet yacht possible, a yacht which deliberately gives away planing speeds or a huge interior space for the luxury of gliding along in silence, with a smooth motion. Or, depending on the conditions, to offer a great sense of speed and power – but always with a perfectly simple handling. Then again, the sheer size of this yacht allows for a high degree of comfort on board and I cannot think of anyone I know who wouldn’t want to go cruising down the coast for a week or two onboard her. 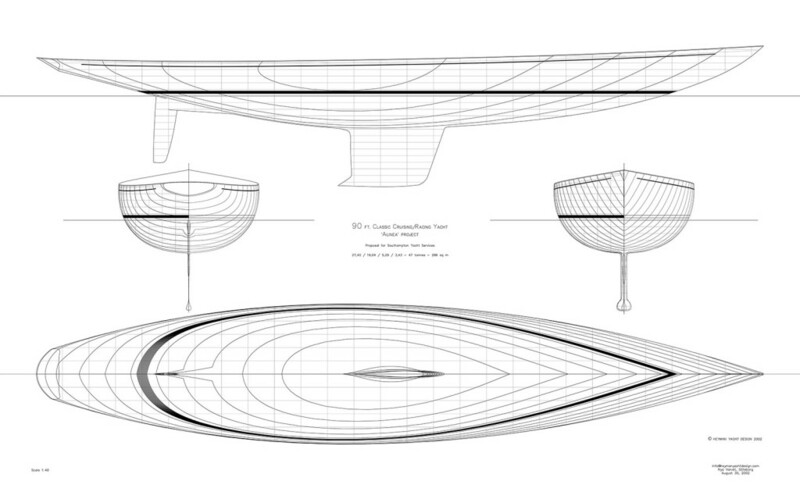 Which leads to the question of size, because at 90′ this is still not a very big yacht. Her interior space and her 48 ton displacement is perhaps more like what you would expect from a 70′ yacht. The rest is just pure luxury… the stern overhang is more than 4½ metres long, or 15 feet. 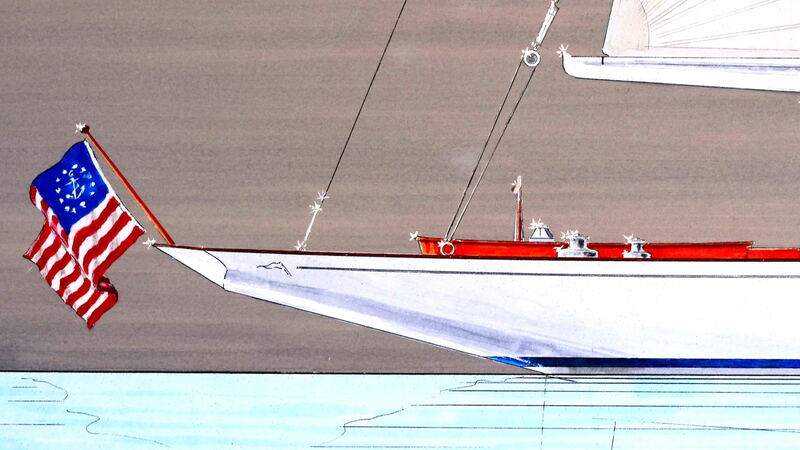 The first inspiration for this design stems from my childhood in Sweden when we would often see Norwegian ship owners sail the most beautiful R 12-metres down the coast from their home ports in Hankö or Oslo, with a small paid crew, showing off their whooping skills in manoeuvring these big yachts to the stone quay in Marstrand – stern to, without engines. Many of these twelves were designed by Scandinavian designers like Norwegian Johan Anker or by British designers like William Fife, G L Watson or Charles Nicholson. Also on the other shore of the Atlantic there were a few pre-war designs by for example Clinton Crane and Olin Stephens. And of course the development of this kind and style of racing yachts owes a great deal to N G Herreshoff of Bristol. Still, I was reluctant to produce another ‘retro’ rubber-stamp modern copy of an oldtimer. Instead, this yacht seemed to plead for a character of her own and I was happy to depart from the usual deck house design with three arched windows in a row – this has come to be a somewhat tiresome cliché in later years. The deck house shown could perhaps be described more as an example of modern ‘functionalism’ design. I think it could well have been designed in the 1930s and feel it goes just fine with the style of the yacht. 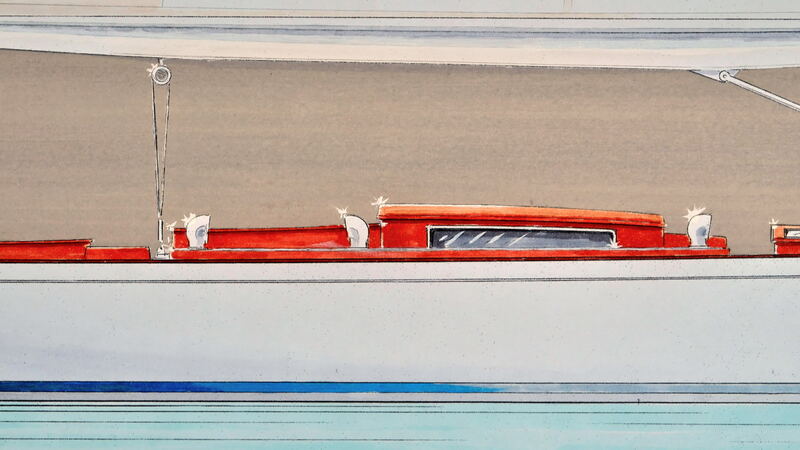 The other departure from her classic roots is her interior volume, and how the layout is conceived, with big open spaces, from the deck house to the starboard side office and forward into the main cabin. The owner’s quarters are forward and the crew is aft, with close access to the cockpit and the galley. Finally, one very obvious departure from her classic heritage is her hull and keel configuration. Nothing particularly innovative here, though – nothing but a fine hull shape, with a good turn of speed and a very manageable yacht despite her overall length. The yacht was intended to be built by Southampton Yacht Services but, for personal reasons, the project came to a halt. This being a rather timeless design, I think the time is always right to pick the project up and get it going again.